Red Quinoa Pilaf, a rif from this recipe at Food52. 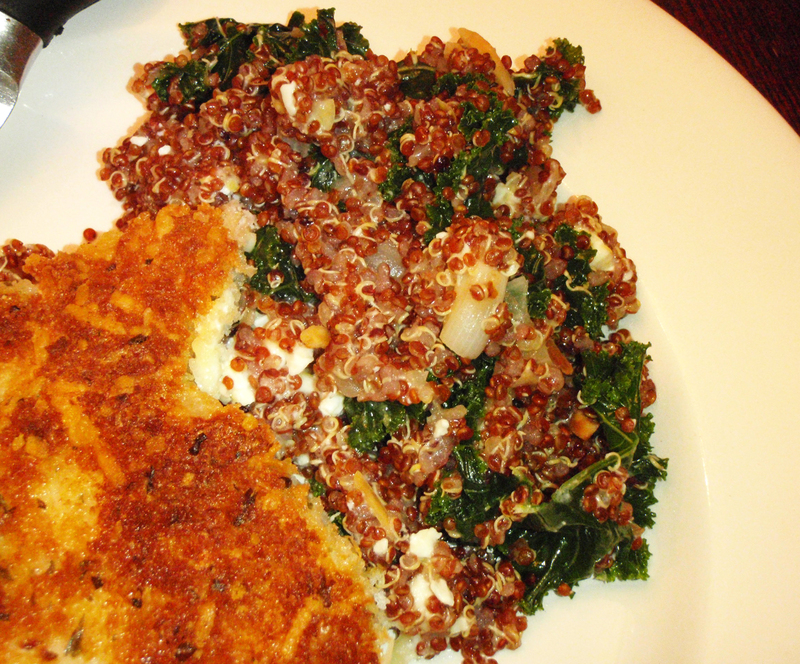 I used red quinoa, sauteed 1/4 onion (chopped) first. Regular lemon instead of a Meyer lemon and feta cheese. I also used truffle oil instead of walnut oil. I was not clear on Chris’s opinion as he initially said ‘this is different.’ Then he got up for seconds before finishing his pork chop (the crispy thing on the side- panko crusted pork chop first slathered with a little brown mustard). From Giada De Laurentiis’ newest cookbook, Giada at Home: Family Recipes from Italy and California (Amazon link), I made this butternut squash soup tonight. Its been snowing and blowing all day, so this seemed like a great choice for such a gloomy, read a good book in bed all day, kind of day. Unfortunately, I did have to venture out to buy the sage but Horrocks is quite close and the snow was keeping the usual Sunday crowd away. I received this cookbook as my prize for winning the Cookbooker challenge by reviewing recipes from a featured cookbook. This is the first thing I’ve made from it. I’m intrigued by some other dishes, especially the lobster risotto (because really, who wouldn’t want that!?!). I doubt I would have bought this book of my own volition simply because I tend to avoid the Food TV cookbooks even though I do like Giada’s show. 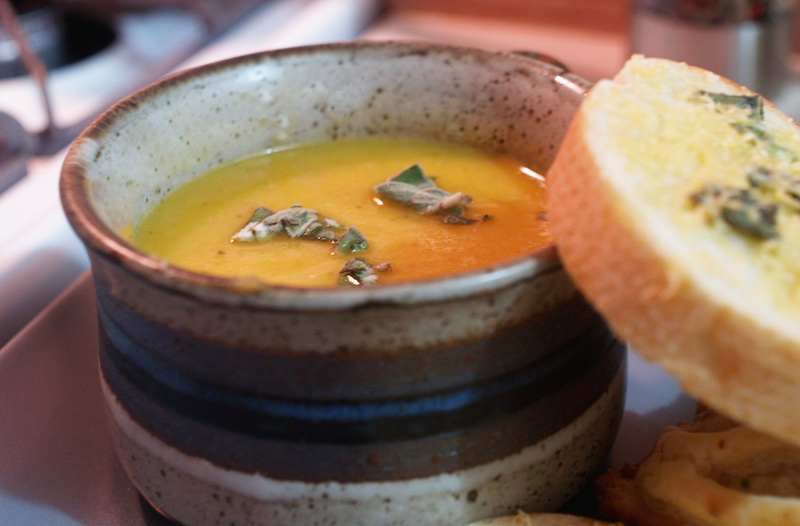 There are some recipes which definitely are more suited to spring but a soup like this is perfect for mid-December. I have been eager to make a pureed soup since ordering an immersion blender (thank you Kohl’s Cash!) a few weeks ago. An immersion blender has been on my ‘wish list’ for-EVER and I discovered that Kohl’s carries a recommended one with a more powerful motor than the cheapie available elsewhere. This one is from Wolfgang Puck and came with a number of accessories I don’t really need but for the price (with the coupon) it didn’t really matter. I did notice that the casing on the motor section gets hot so as I use it, I’ll need to be mindful of that. The soup is easy enough: onion, carrot and garlic sauteed in butter/olive oil then diced butternut squash added along with several cups of broth. Bring to a boil, add sage then cook 20 minutes or until veggies are soft enough to blend. We liked it though I did have to adjust the salt for more flavor boost- I didn’t use low-sodium broth so this surprised me but it wasn’t enough to make me worry about sodium. I do think I might make this in the future with oven-roasted squash. A little (or a lot) caramelization never hurts. The recipe called for fontina cheese melted on baguette which I didn’t have and didn’t see at Horrocks so I just picked something that would melt and sounded good. In this case, it was Beeemster XO Gouda. The XO stands for extra old or aged. It is a harder cheese and nuttier than regular gouda but not smoked, as you can sometimes find gouda. Good on the bread, and yummy straight up too. Between the fun of immersion blending and the cool new soup mugs I won at the charity auction (through work) last week, I see plenty more soups in my future. First, I made some cheese scones with extra sharp cheddar cheese. 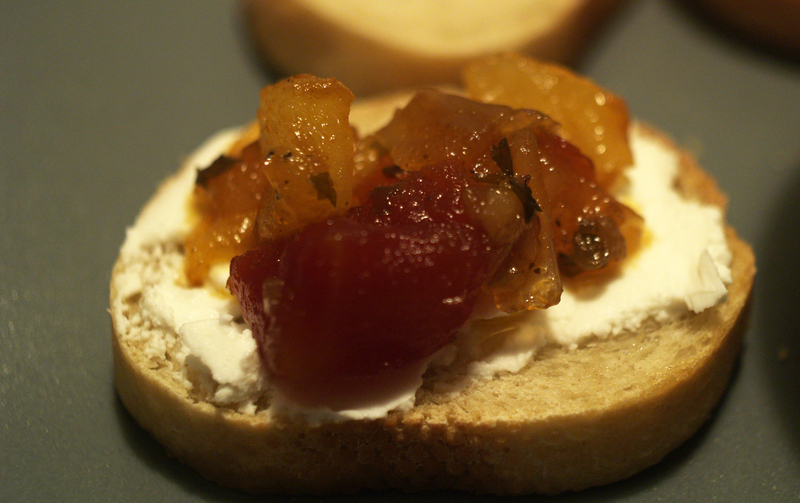 We just snacked on those earlier in the day, along with some crackers and fancy salame made with wine. About 2:30 pm, I put an 11-pound turkey in the oven. But first, I rubbed butter mixed with rosemary and garlic in to the skin. Inside the turkey, I stuffed a few quartered onions, a head of garlic (sliced open) and 2 sprigs of rosemary with a few more onions and garlic cloves tossed in the bottom of the roasting pan along with 3 cups of chicken broth. Roasted at 450 for 45 minutes then turned down to 350 and cooked until the thermometer stuck in the thigh registered 160 (about 2 hours). During the roasting, I also basted the bird every 20-30 minutes with the juices. For stuffing (okay, dressing- it didn’t go in the bird), I based my creation on the one the Pioneer Woman made during her Thanksgiving Showdown with Bobby Flay. I used just french bread cubes and skipped the pancetta. I also used a vegetarian broth and added celery to the apples. Last change was just a scaling down to make 6-8 servings, not 16. I made my usual mashed red-skins and cooked up some gravy from the pan drippings and chicken broth cooked with the neck. In years past, I’ve added the giblets to the gravy after mincing but I skipped that this time. The gravy was, hmm, a little thick. But perfectly seasoned and quite tasty on top of the turkey, mashed potatoes and stuffing/dressing. I expect it will be tasty on top of whatever else I use it on the next few days. I foresee a turkey salad grilled flatbread sandwich in my future. About a month ago, I started to review a cookbook for Cookbooker, a website for reviewing cookbooks and recipes from those cookbooks. There was a challenge involving a cookbook meant to provide lots of flavorful dishes with minimal time and labor. I didn’t own the cookbook but started with the freebie recipes. Thanks to my mom, I learned the website was giving away a copy of the cookbook, High Flavor, Low Labor, on their site blog. And I won! 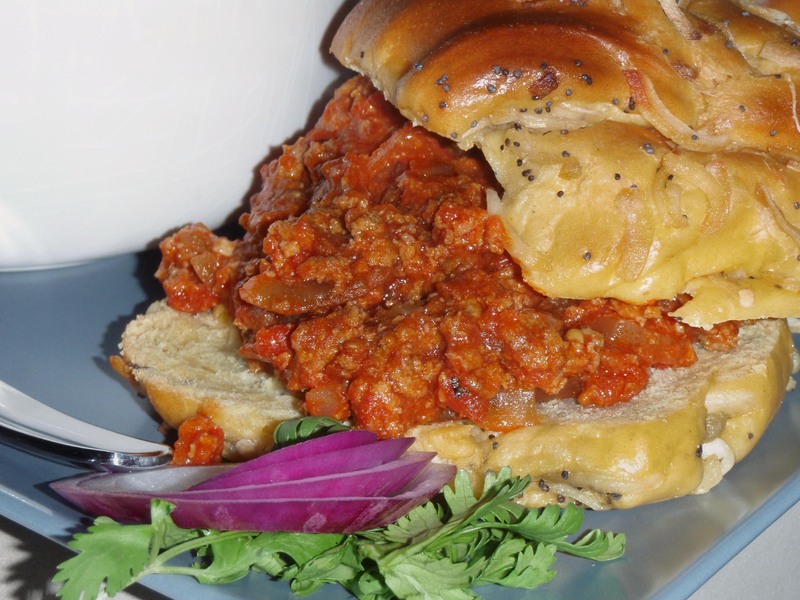 Once it arrived, I made an effort to try an assortment of recipes from the sections: appetizers, main dishes, soups, sandwiches, sides and pasta dishes before the challenge was over. There are still five days left in the challenge and I”ll get through two or three more recipes but I don’t need to wait to call this cookbook a five spice hit. We’ve only had one thing not be a complete success and it was probably not the recipe’s fault. Tonight, I made steak, marinated in garlic, lime, soy sauce and rice wine vinegar (seasoned for sushi). 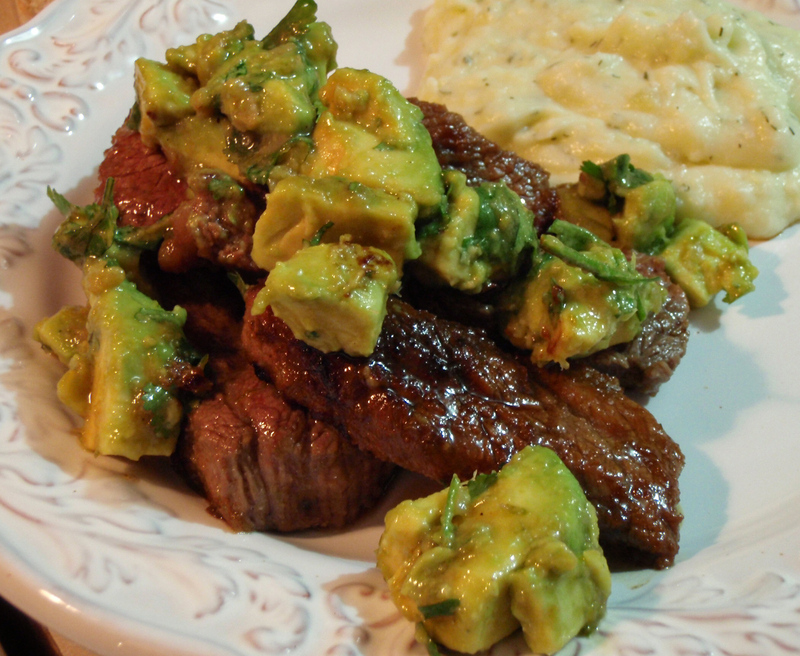 The steak is topped with an avocado and cilantro salsa which was tossed in some of the reserved marinade. To accompany this, we had mashed potatoes seasoned with dill and horseradish. Bonus for the Spartan-themed dish. Other items made so far include chimichurri chicken with asparagus and roasted potatoes, pesto chicken and the previously reviewed steak and linguine. Before the challenge is over, I’m hoping to make the turkey & gouda pizza, a truffle oil extravaganza and something for Thanksgiving dinner but this book will see regular rotation as we work through all the recipes tagged with ‘try’, which just happens to be more than two-thirds of them! While I can’t say this recipe is all super-healthy, its not horrible, nutritionally speaking. Well, except for those potatoes with the cream, butter and cream cheese. Importantly, the recipes live up to the goal of the book: lots of flavor, pretty easy to put together. I also like that many recipes have overlapping ingredients. We use a lot of balsamic vinegar so that is always on hand but when I buy a tub of goat cheese, its nice to know that I’ll be able to use it up in a week’s time by making at least two different, unique dinners. The same author has written a vegetarian cookbook with the same focus on flavor first: Venturesome Vegetarian (amazon link) which I can’t speak for but is available used for $2.50! Kind of hard to go wrong in that case. Thanksgiving is just over two weeks away. I have been saving recipes for new things to try. Except I may not be making Turkey Day dinner this year. Guess I better get our schedule figured out ASAP. We are thinking of going to visit my brother, his wife and their new baby. SO maybe I will be cooking dinner but not in my own kitchen. As long as the pilot light doesn’t go out on their oven, it should be okay. Besides turkey, I’ve found a decent looking green bean casserole that is sufficiently different from the old canned bean version of my youth that I am willing to try it. Gotta make that corn and wild rice thing again, from last year. And its not a holiday without mashed potatoes and gravy. Since most of my dad’s family lives out in Iowa we made end up crashing someone else’s dinner. Expecting my brother’s family with their 2 month old preemie baby to be able to entertain us food-wise seems exceedingly unreasonable, after all.